After lengthy discussions, the administration of Reddit made changes in the content policy of the resource by prohibiting Reddit from carrying out transactions related to various prohibited goods and services. Under the ban were : weapons, drugs (including alcohol and tobacco), stolen property, personal data, fake documents, as well as paid services that involve physical sexual contact. 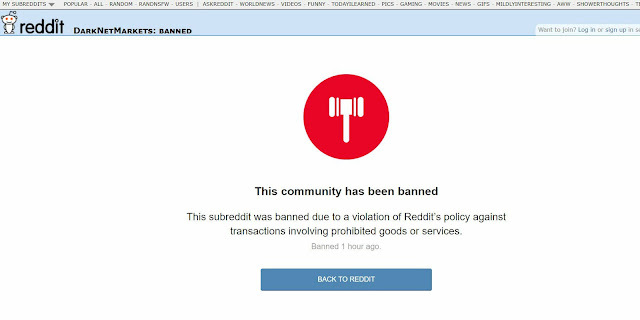 Since the new rules have already come into effect, communities (or, as they are called here, sabreddits) are the first to be banned on the trading platforms in darknet: / r / DarkNetMarkets, r / xanaxcartel, r / DNMSuperlist and r / HiddenService. It is worth noting that the DarkNetMarkets community has always been very controversial and, in fact, was one of the largest sites on the Internet for gathering drug dealers, hackers and other cybercriminals, as well as their clients. It was here that after the elimination of such famous marketplaces like Silk Road and Alphabay, heated discussions unfolded, users shared their opinions about where the trade would now go and customers were looking for their permanent dealers. Here they also discussed "threw", the quality of the goods purchased and the transactions conducted. So, in 2015, the US intelligence services asked the Reddit information about users of DarkNetMarkets through the court . At the time of closure, there were about 180,000 readers at sabreddit. Although Reddit already has a number of new communities devoted to darknet-marketplace, it is unlikely that they will last long - now the site administration can block them at the first signs of violations.